The Women’s Christian Temperance Movement (WCTU), formed in Ohio in 1873 with the goal of creating a “sober and pure world,” began to influence the city. 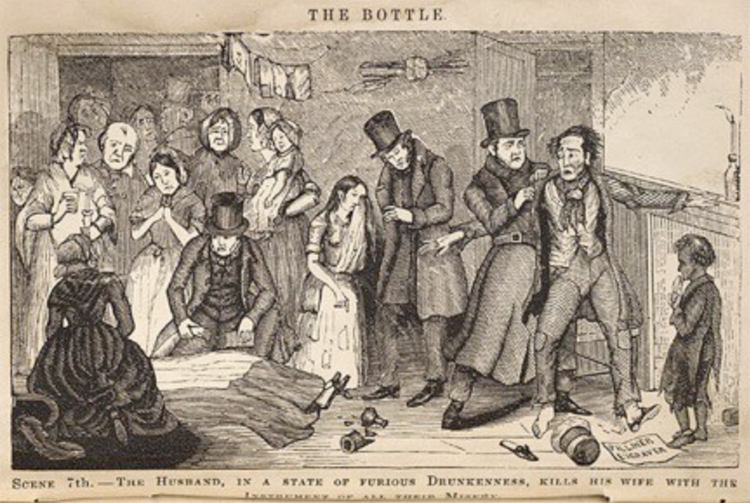 The movement was spurred by several causes, including joblessness, vagrancy, spousal and child abuse, and family neglect by problem drinkers, but also in part by national anti-immigrant sentiment. According to historian Eric Foner, many Americans “blame[d] immigrants for urban crime, political corruption, and a fondness for intoxicating liquor.” In particular, Irish and European Catholics were considered particularly intemperate, and German brewers added to the problem—and Irish and Germans Catholics made up the vast majority of the 4 million immigrants that had come to the U.S. between 1840 and 1860. It was a reflection of the U.S. social hierarchy of the 19th century, where wealthy Protestants—primarily Methodists, Presbyterians, and Episcopalians—of British or German descent stood at the top and Catholics, particularly Irish and Southern Italians, near the bottom. According to Duluth historian Heidi Bakk-Hansen, “From its earliest inception the WCTU enjoyed a following amongst the wives of Duluth’s richest men.” In 1881 the Duluth citizens incorporated the Duluth Temperance Society, which was “devoted to opposition to the liquor traffic,” and had $20,000 in capital stock, worth about $485,000 today. The money financed lectures and other public awareness efforts within the city’s immigrant neighborhoods. From 1870 to 1919, when Prohibition became law, Duluth newspapers printed over 6,000 articles and announcements regarding the Temperance movement. The influence of the Temperance movement in Duluth is perhaps best reflected in the community of Lakeside, including Lester Park, which developed out of the former township of New London in the mid-1880s. The community was founded by William Sargent, whose father, Duluth pioneer (and Jay Cooke’s agent in Duluth) George Sargent founded and financed the construction of St. Paul’s Episcopal Church, Duluth’s first church. William Sargent had inherited his father’s property, which included all of New London, after his father’s death in 1875. When he and other wealthy Protestants of Methodist, Episcopalian and Presbyterian faiths established the Village of Lakeside in 1889, they forbade the sale or manufacture of liquor within its borders. Despite their obvious belief in temperance, there is no evidence that the pioneer citizens of Lakeside were any more anti-immigrant or anti-Catholic than Duluth’s other wealthy Protestants. In fact, other than the 1891 legislation, there are no surviving documents that address the community’s liquor ban. And while its initial citizens may or may not have included Catholics (or Lutherans, for that matter), we will never know for certain: the 1890 U.S. Census, which would have cataloged Lakeside Township’s population by ethnicity and religion, was destroyed by fire in 1921. While we have no census data, the religious background of Lakeside and Lester Park’s pioneers is reflected in the development of the community’s churches. Lakeside Presbyterian and Lester Park United Methodist churches were established in 1890; St. John’s Episcopal in 1894. Not enough Catholics lived in Lakeside to establish a congregation until 1914, when St. Michael’s Catholic Church was established. Early Lakeside was also low on Lutherans; Lakeside Lutheran Church formed in 1915. From Mayor Markell’s 1872 declaration about Sunday liquor sales through the formation of St. Michael’s, Duluth faced the same alcohol issues as the rest of the nation—primarily Sunday alcohol sales, the prohibition of women in saloons, control of dancing and other entertainment within drinking establishments, and shutting down unlicensed drinking establishments or “blind pigs.” And like other cities, Duluth had its pockets of vice. The two most notorious were the St. Croix District and the Bowery. The St. Croix District was also known as the Tenderloin, the nickname given the San Francisco neighborhood that was once home to the city’s prostitutes. It was essentially made up of boarding houses along the 200 block of St. Croix Avenue (today’s Canal Park Drive) and its alley, essentially between Sutphin and Railroad Streets in what is today the Canal Park Business District. Saloons and cheap residential hotels—often temporary homes of sailors—surrounded the brothels. Duluth’s Bethel, a Protestant-run facility established in 1873 that ministered to the homeless and those suffering the ravages of drink, built its first permanent facility adjacent to the tenderloin in 1888. In 1914, the city, led by Public Safety Commissioner John Hicken and Police Chief Chauncy Troyer, tried to move prostitution out of the area and clean up the area’s image. Previous efforts had been made, including in 1908 when the city council vowed to rid the district of its “scarlet women.” One strategy was to rename St. Croix Avenue South First Avenue East. Despite that effort, and others during Prohibition and again in the late 1930s, prostitutes operated in the area as recently as the 1970s. Duluth’s Bowery, like others throughout the U.S., was named for Manhattan’s most-blighted neighborhood—then a den of vice populated primarily by alcoholics, criminals, and prostitutes. It developed between Fourth Avenue West and Mesaba Avenue along Michigan and Superior Streets in the 1890s, where cheap hotels and no less than 25 saloons sat among Duluth’s fanciest hostelries and the elegant Lyceum Theatre, a conflicting message to those arriving in Duluth by train: the Bowery greeted poor immigrants and wealthy industrialists alike as they emerged from Duluth’s Union Depot and, later, the Soo Line Passenger Depot. By 1894, the Bowery had so many down-and-out residents the Bethel opened a second facility in a rented building along the 500 block of West Superior Street. It would take over 60 years and the literal demolition of the entire Bowery to eliminate Duluth’s largest pocket of vice. In 1916, Duluthians—led by voters in districts representing Protestant strongholds Hunter’s Park, the East End, and Lakeside—elected to go dry. The law took effect July 1, 1917. Three months earlier rabid-Prohibitionist John L. Morrison launched his notorious Rip-saw newspaper, which would attack intemperance at every opportunity. In September, the Duluth chapter of the WCTU celebrated its victory over booze with a banquet at Duluth’s First Presbyterian Church. Nationwide Prohibition—also known as the Volstead Act for its author, Minnesota 7th District Congressman Andrew Volstead—passed in 1919 and became law on January 16, 1920.